Part 2: The Blogger gets the opportunity to meet his hero, and discusses what the experience of being a super-fan is like. So I entered the Barnes & Noble at 82nd & Broadway in New York City where Ryan Conklin’s book event for An Angel From Hell would be held that evening. The first thing I noticed was the highly attentive guard standing menacingly at the door. It’s not something you see in Indianapolis. I don’t think we even have guards in our bank lobbies. It’s not that we’re Mayberry, but whatever our meth heads or kleptos are stealing from stores, I’m sure it’s not the Oxford English Dictionary. I didn’t immediately know where to go to where Ryan would be, so I just walked around the store nonchalantly, looking at the books and keeping my eye out for a microphone or sign or something. It’s not my style to act like I don’t where to go. It’s why I don’t carry a map or a guidebook in a strange city. I’d rather accidentally find myself in Jersey than look like a tourist. Eventually I went upstairs and found where there was a bunch of chairs lined up with a dais in front of them. A big Ryan Conklin poster confirmed I was in the right place. It’s was an hour and half before the scheduled start time, but as I expected, there were some people sitting there already. There were about ten rows of chairs and a dozen or so people were scattered across them. I was still undecided whether or not I wanted to be inconspicuous and hide in the back, or try to sit closer. So I sat in one chair towards the back and then kept moving up row by row, until I decided that after spending around $700 so far on the trip that, Hell yeah, I’m going to sit in the front row. I was tired from getting up early that morning to go to the airport, and from walking around and walking to the store, so I sat back and tried to relax for the next ninety minutes. I could have picked a book to read off the shelf next to me, but I was sitting directly next to the bookcase of feminist political theory and lesbian fiction and I didn’t see anything that was necessarily more interesting than just thinking about Ryan’s book. From time to time I looked around to see who else among the early-birds was sitting in the audience. Some of the people I recognized from their pictures on Facebook. I of course know who all the regulars are on the RyConk page. Those people were in the front. In the middle appeared to be people who were using the chairs as a place to sit while they read a book instead of paying for it. In the back were a few people that I think might have been using the B&N as an indoor place to get a little shuteye instead of using a park bench. The guard at the door didn’t seem so proficient to me anymore. As the time drew closer I couldn’t even try to relax. Not only was I in the same city as Ryan, I might at that moment even be in same building. The breaths got deeper and and the pulse quickened. My senses became keen for the first sign of Ryan being anywhere within the area. Suddenly, the first magic moment occurred. From several aisles over, I could hear the unmistakable voice I’ve heard so often. I held my breath and let the rush pass through me. There was some amount of nerve-wracking time between that and the moment that Ryan made his appearance. I just focused on keeping calm. I actually had to keep my eyes looking down at the floor, because I didn’t want to feel the jolt I knew I’d feel when he first came into sight. 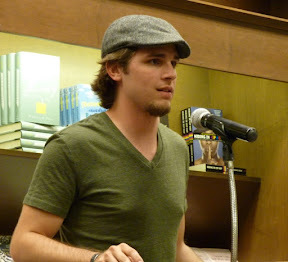 Then quietly the B&N manager walked to the podium, with Ryan behind and me slowly looking up. So it began. The manager gave a laudatory introduction, while Ryan sat in a chair on the platform. He seemed kind of uncomfortable as the praises were spoken. I noticed his hair was longer than ever, but it didn’t matter to me. He could grow his hair down to his ankles and gain 300 pounds, but to me he”d still be Ryan. After the introduction, Ryan took his place at the podium and gave a brief history of himself and of his book. After that, the audience was allowed to ask questions. 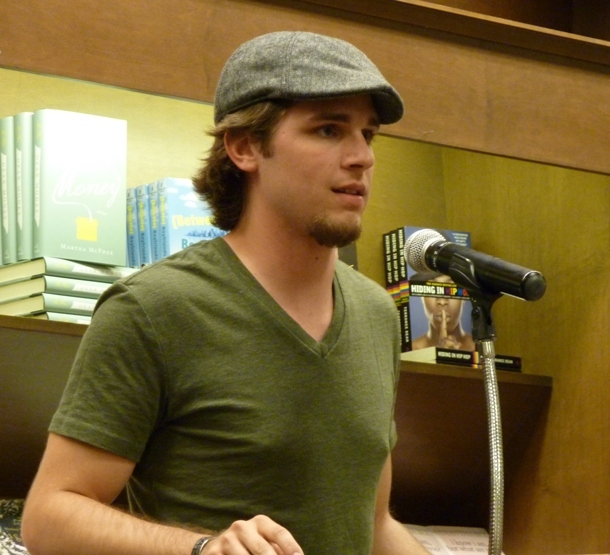 You can read about Ryan Conklin at the book signing event at the link. I already knew all of the Ryan Army material backwards and forwards, but hearing it live was enthralling. I wished it could have lasted all night. When there were no more questions, Ryan sat back down and people were allowed to walk up and present themselves and get a signature. Some people brought gifts, which I had wanted to do but didn’t. I really regretted it later, but I was able to rectify the situation by sending this shirt to Ryan Conklin after I returned home. As people spoke with Ryan, I still wasn’t sure what I wanted to do. On the one hand, of course I wanted to meet him, but on the other hand the thought of it was very intimidating. Celebrities are well-known for crushing the spirits of random fans through their callousness. What if I introduced myself and he said something negative? That would be horrible. Did I want to take that chance? Sometimes before Ryan does something that’s not good, he says, “If they had played by the rules…” What rules? I never got a rulebook. Was I in violation? In the end, after everyone else had gone up, I steeled myself for come what may and willed myself forward to the table. When I had imagined introducing myself, I usually pictured myself passing out or getting the shakes, so I kept my mind on keeping it together. I introduced myself and Ryan acknowledged me. I was so nervous that I unfortunately don’t have distinct memories of the experience. I’m pretty sure I got to shake his hand, but I can’t visualize it now. Ryan asked if I traveled to NYC often. I replied that no, I had only been there once before. Then he started talking with the B&N person. I wish the opportunity could have lasted longer, but like Machine, he didn’t have time, really. I wasn’t able to get a picture with. I was stupid for not buying a copy of the book while I was there. By having a book to sign, I would have bought more time. I left the store and hoofed it back the two miles to my hotel in the rain. I was sad that it was over, so the rain was appropriate, but I was glad that I was able to accomplish something important that I had set out to do. Curious to know when he has specifically said the “If they had played by the rules” comment. Do you people have a facebook fan page for Meeting Ryan Conklin (part 2) | Trick Notes? I looked for for one online but could not see one, I’d love to become your fan! Sorry I write you via comments. But I could not find contact e-mail or feedback form on your site. We are looking for new advertisement platforms and we are interested in your site tricknotes.com. Is it possible to place banner on your site on a fee basis? Please, contact us at e-mail. Trata da estrutura de monografias e TCCs.